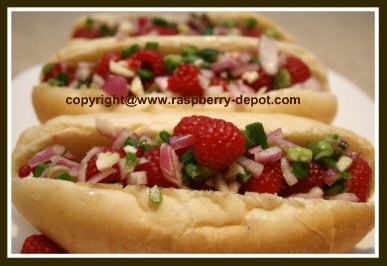 This Raspberry Relish Recipe, see the pictures(! 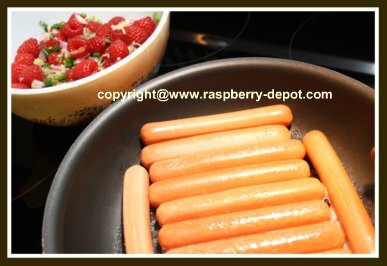 ), makes an amazing homemade relish for hot dogs, sausages, chicken, and more! I made this relish for dinner last evening, and served it with hot dogs. My husband and daughter loved it, and said that "regular" condiments and store-purchased relish do not even come close to the taste of this fruit relish! It takes serving hot dogs to a whole new level! Try it as a raspberry salsa on chicken and turkey too! In a bowl, combine all the ingredients except the fresh raspberries. 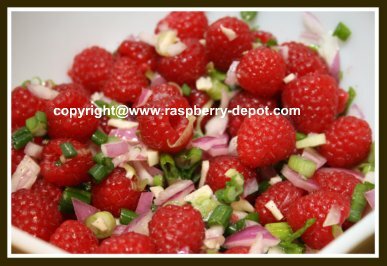 A little before serving time, add the fresh raspberries, and mix in very gently, being careful not to break up the raspberries. Serve with hot dogs, or use as a salsa on turkey or chicken! This recipe is a welcome change from "regular" condiments. Be sure to make enough! Raspberries don't only taste delicious, but they are also very healthy! Raspberries are nutritious and low in calories (1 cup of raspberries contains only about 60 calories). They are rich in Vitamin C, a good source of Vitamin B12, Vitamin B3, folate, magnesium, and a good source of dietary fibre. Additionally they are high in antioxidants and ellagic acid.